This newly released Hubble image shows dwarf galaxy UGC 4459, which is located approximately 11 million light-years away. Despite being less famous than their elliptical and spiral galactic cousins, irregular dwarf galaxies, such as the one captured in this NASA/ESA Hubble Space Telescope image, are actually one of the most common types of galaxy in the Universe. Known as UGC 4459, this dwarf galaxy is located approximately 11 million light-years away in the constellation of Ursa Major (The Great Bear), a constellation that is also home to the Pinwheel Galaxy (M101), the Owl Nebula (M97), Messier 81, Messier 82 and several other galaxies all part of the M81 group. 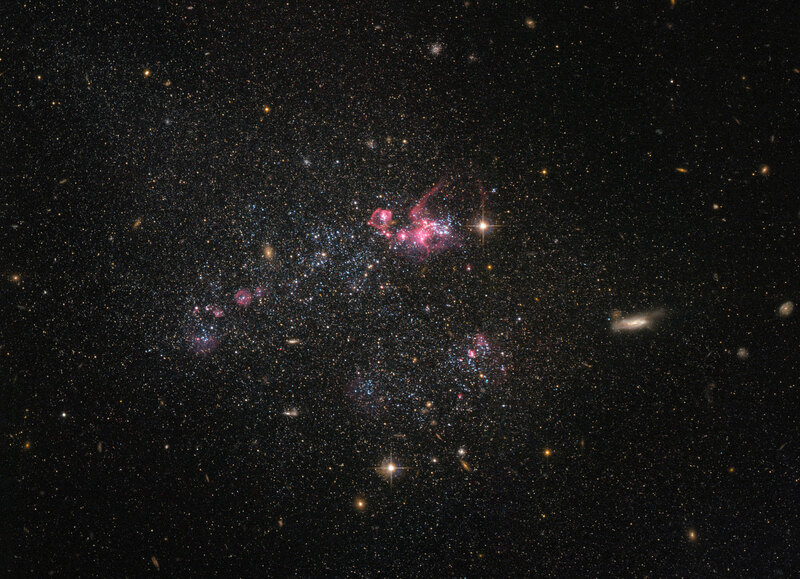 UGC 4459’s diffused and disorganized appearance is characteristic of an irregular dwarf galaxy. Lacking a distinctive structure or shape, irregular dwarf galaxies are often chaotic in appearance, with neither a nuclear bulge — a huge, tightly packed central group of stars — nor any trace of spiral arms — regions of stars extending from the center of the galaxy. Astronomers suspect that some irregular dwarf galaxies were once spiral or elliptical galaxies, but were later deformed by the gravitational pull of nearby objects. Rich with young blue stars and older red stars, UGC 4459 has a stellar population of several billion. Though seemingly impressive, this is small when compared to the 200 to 400 billion stars in the Milky Way! Observations with Hubble have shown that because of their low masses, star formation is very low compared to larger galaxies. Only very little of their original gas has been turned into stars. Thus, these small galaxies are interesting to study to better understand primordial environments and the star formation process. 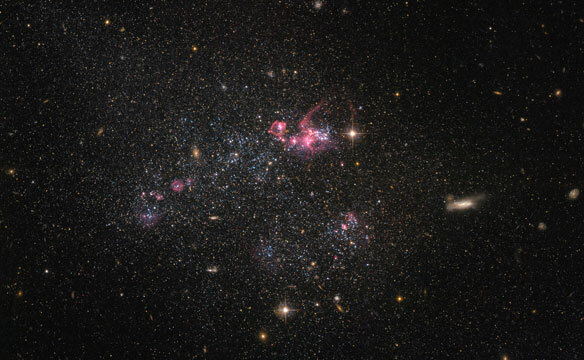 Be the first to comment on "Hubble Image of the Week – A Distinctly Disorganized Dwarf Galaxy"